That being said, commercial construction is a fun & challenging environment for us to operate in. It’s also a realm that we understand and have been operating in for over 30 years. As times change, so do industry standards. With the DFW Metroplex being so large, it’s hard to imagine that commercial complexes are still popping up across the area. Believe us, there is plenty to still be built and a lot of it is in popular areas such as Las Colinas! Las Colinas is an area sprawling with new construction. From the River Walk, new condominiums, restaurants & commercial offices & hotels, it’s a growing area with lots of growth! 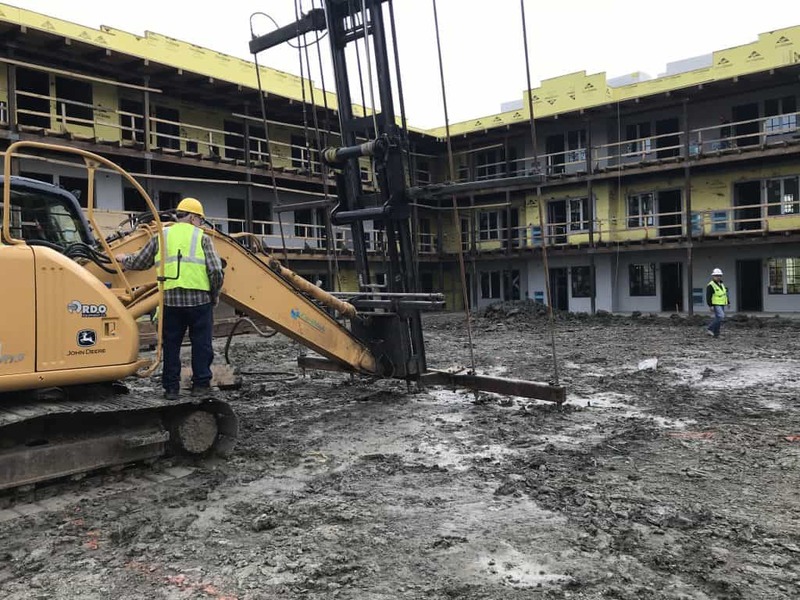 The Valencia Group, a hotel chain very popular through Texas, is in the process of creating their newest hotel: The Texican. To add to its allure, the Valencia Group is building this Texan-style hotel adjacent to the Irving Convention Center. Visitors will be able to lodge in this Texan style hotel complex while frequenting music halls & enjoying the fantastic restaurants of downtown Las Colinas & Irving. With a drive-up style lodging, The Texican will offer a fun atmosphere designed around open-air concepts & unique gathering spaces. Their swimming pool is going to be a focal point of these unique spaces. Our job is to build a gorgeous swimming pool that their guests are going to love and enjoy! Earthlok specializes in the injection of Ionic Clay Soil Stabilizers. These chemicals are environmentally safe & work to stabilize these expansive clay soils. 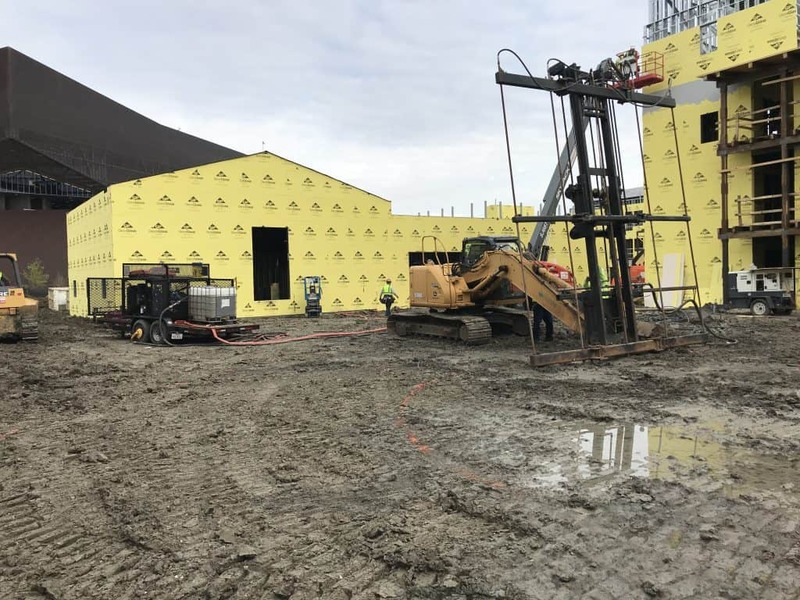 It’s a unique foundation technique that is becoming popular in many areas of commercial construction. We are sub-contracting our foundation work to Earthlok to help us stabilize the soil beneath the area where our pool will rest. The Valencia Group is in the process of constructing their newest hotel: The Texican. This hotel is designed with a modern Texan appeal. It’s designed to be an open-air entertainment venue with multiple gathering spaces. Our swimming pool is going to be a fun area for guests to gather and relax during their stay at this gorgeous hotel! Quality control standards for new foundations is an ever-evolving science. Grounds shift and change over time and the water-absorbent clay soils prevalent to Las Colinas complicate our construction procedures. To simplify the process, we partner with Soil Engineers – similar to the ones used on the Khaldoun Job. North Texas is home to clay soils. These soils are very expansive due to their high rate of water retention. As things heat up and evaporation takes place, these soils contract. During heavy rain seasons, these soils drink it all up and expand. This creates a volatile environment for our buildings and swimming pools, which can lead to cracking & foundation issues. Lucky for us, Las Colinas is home to these clay soils (sarcasm intended). Knowing this, we partner with our soil engineers to craft a game plan to move forward. 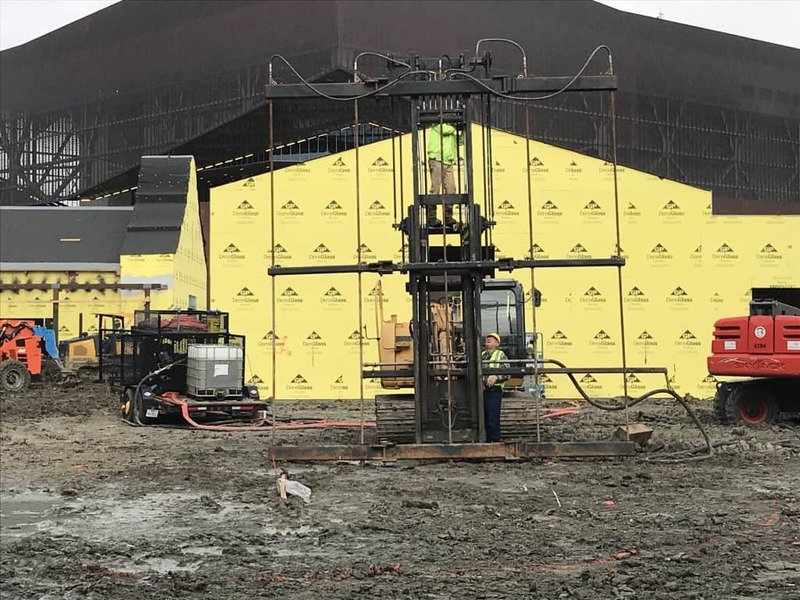 Our typical strategy is to install concrete piers all the way down to bedrock. In theory, piers act like table legs that support our swimming pools and prevent movement despite the existence of expansive soil conditions. Ionic Clay Soil Stabilization acts to remove the attraction of Clay Particles to Water Molecules. This causes clay soils to lose its affinity for water. Hence, no more expansive clay soils! 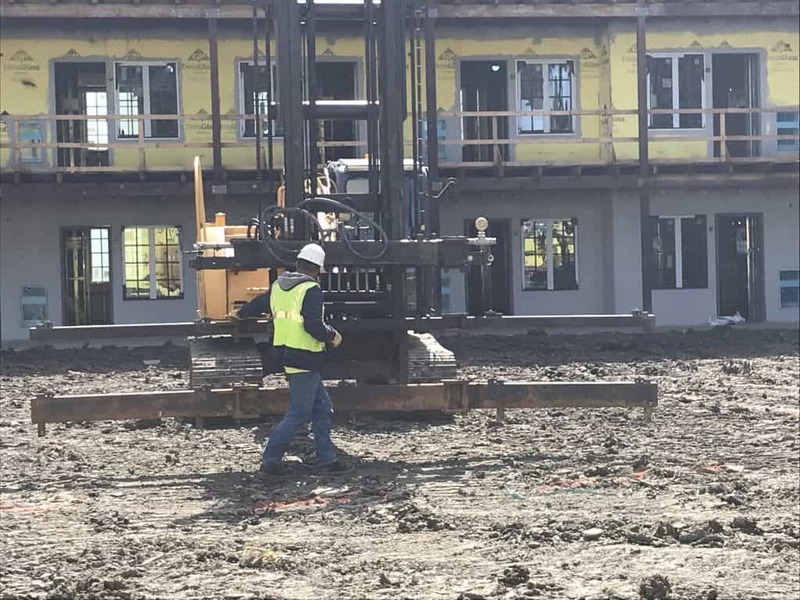 For the purpose of this pool installation, we are injecting over 47,000 gallons of ionic solution into this soil to remove the hydro-static attraction of water to the clay particles. Cool stuff! Pier setting works great in most situations: typically on smaller swimming pools with limited Surface Area. The Valencia Swimming Pool is a different entity altogether. This swimming pool is going to be a large structure providing lots of surface area for guests to rest and relax during their visit at The Texican. To compensate and prep our soil for a pool of this commercial scale, we needed to use more advanced methods of soil preparation. Calling on our soil experts, we identified a Chemical Injection company in DFW called: Earthlok Soil Stabilization. This Earthlok Rig is injecting over 47,000 gallons of ionic treatment into these clay soils. This treatment is injected 15′ below the surface to stabilize the soil beneath our swimming pool. This creates a long-lasting foundation that is neutralized by expansive conditions. As you can see from our images, Earthlok uses highly specialized installation rigs to inject the soil with their proprietary chemicals. These injection probes reach down as far as 15′ to penetrate deep into the soil. This stabilizes the soil beneath our swimming pool. *We would like to credit this information (listed above) with the information that we obtained from the Earthlok website. We are proud to work with this talented team of soil experts and proudly support their ability to stabilize expansive clay soils in North Texas. As you can see, there is a lot of technical aspects to swimming pool construction. It’s not as simple as digging a hole in the ground and constructing a swimming pool. We are proud to share all of this technical knowledge with our readers because we want to educate and inform you of how we think as pool builders. Our second objective is to show our readers that purchasing a swimming pool is an involved process that aligns your investment with a pool builder that you should trust. At Summerhill Pools, we do not skip steps and we invest our time and resources in construction techniques that are proven to work. We stand by our products and we always inform our customers that they are purchasing a swimming pool that will last from experts that know how to do it best. If you’d like to speak with us and learn more about how we can build you a quality swimming pool, we invite you to stop by our office or give us a call. We would love to meet you at your home, provide you with a free estimate & 3D Pool Studio drawing and give you some ideas for your own backyard! Building swimming pools is what we love to do and we are sure that you will enjoy years upon years of backyard entertainment with a Summerhill Pool of your own! Khaldoun Job Part #2 – Installing Geo Foam! Saint Albans Drive Job – Simply Stunning! Dallas Pool Builder – Ready to Build Your Summer of Fun!